Bryan Wilder is a fourth year PhD student in the Department of Computer Science at USC, working under the direction of Professor Milind Tambe. Wilder’s research focuses on optimization and machine learning, and how these techniques can be leveraged for social good. He has received an award from the International Conference on Autonomous Agents and Multiagent Systems (AAMAS) and is supported by a National Science Foundation graduate research fellowship and a USC Annenberg Fellowship. 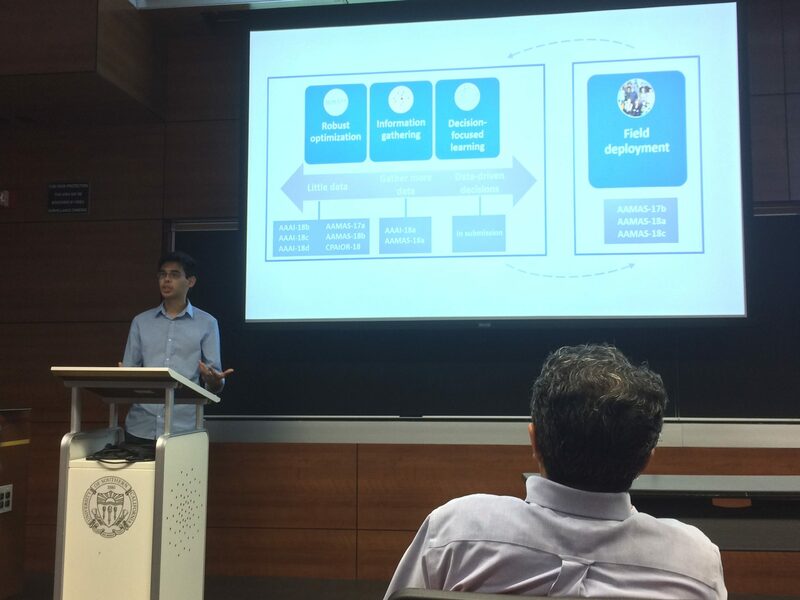 The focus of his September 12th talk was to describe an example application of his work using AI algorithms to maximize the impact of social network interventions to reduce HIV risk among homeless youth. Technical topics ranged from robust optimization to model uncertainty, and how to use information gathered from youths’ social networks most effectively to enhance the reach—and therefore the public health impact—of such interventions. 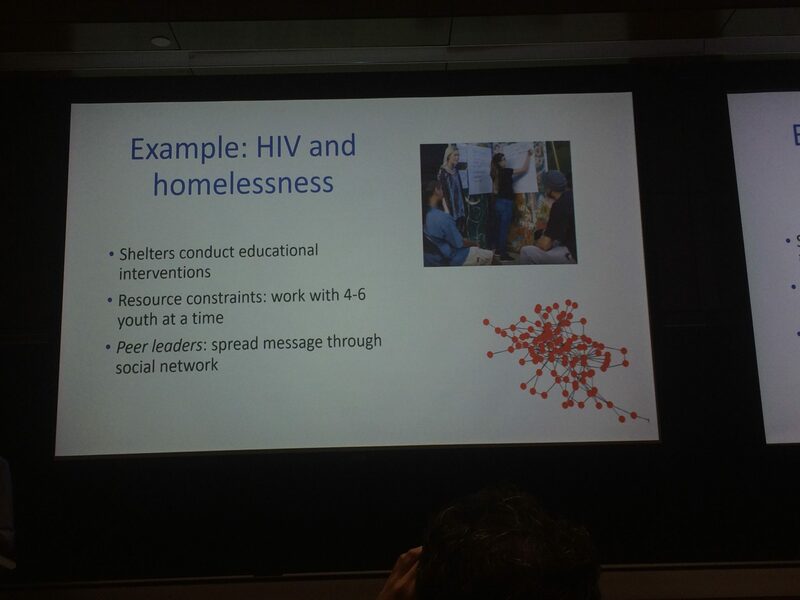 He then related these technical topics to results collected in real-world field settings within Los Angeles-area drop in centers for homeless youth. Recent estimates indicate there are about 6,000 homeless youth within Los Angeles. Due to the high prevalence of HIV among this population (roughly 10 times that of the general population), HIV poses an enormous threat to the health of homeless youth. Many shelters and drop-in centers provide HIV testing and education. However, these efforts are often limited by resource and staffing constraints. By leveraging youths’ social networks, public health programs can maximize the spread of health-promoting information. Such efforts have relied on training central network members (peer leaders) to help spread health-promoting information throughout social networks. One of the major challenges here has been determining which network members to select as peer leaders (dubbed the “influence maximization problem”). From an AI perspective, this can be thought of as a computational problem. Specific challenges include not having enough adequate data to model how to best spread information throughout a network, and not knowing the actual structure of the network. Traditionally social network interventions are difficult to implement in real world settings with limited resources, as they require time intensive interviews with every network member. Wilder uses robust optimization to address the problem of limited data. In practice, agencies do not know how social influence spreads through the population (formally captured via the probability of information propagating between each pair of youth). 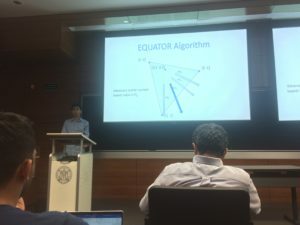 To handle this modeling uncertainty, Wilder developed the EQUATOR algorithm, which selects peer leaders who perform as well as possible across all the different scenarios. Next, Wilder addressed the data collection problem: collecting complete social network information is costly and time consuming; is it possible to have effective interventions with a limited amount of data (by sampling a portion of network members)? We know from research that information tends to spread locally within small communities of individuals. Therefore, it is best to plant a “seed” (a trained peer leader) in each of the largest communities. Wilder created the ARISEN algorithm to randomly select sample seeds and estimate the size of their community. Thus, the ARISEN algorithm repeatedly surveys a random node and one random neighbor to determine the best seeds to select as peer leaders. Wilder went on to describe how his algorithms have been tested in the field. In a larger HIV prevention study, three of Wilder’s experimental, AI-based algorithms were compared to the status-quo approach (selecting peer leaders based solely on their popularity) in two drop-in centers in L.A. About 60 youth were recruited at each center, and 10-12 youths were selected to be peer leaders. Results showed that the AI-based algorithms dramatically outperformed the status-quo approach, resulting in 70% of non-peer leaders receiving the HIV protective information (compared to just 27% using the status-quo approach). Wilder closed by describing recent work on decision-focused learning. Unlike robust optimization, which tries to make the best use of a limited amount of data, decision-focused learning uses the best available data to make the best decisions. The idea here is to use AI not just to make accurate predictions, but to make high quality decisions as well, and Wilder’s recent simulations suggest that this is the case. Wilder’s work is an example of how AI offers a means to improve people’s lives—in this case, vulnerable youth populations that receive care and services within low resource settings. The challenge for AI is to think about how to deploy algorithms in innovative and unified ways. Such technical progress is bound to affect social change.